The heist of the century has just happened, and you´ve been hired by the casino to find and return the stolen money before its grand opening...in 16 hours! 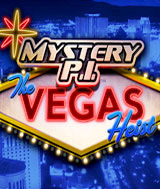 Search for more than 2,300 cleverly hidden objects in 25 hot Mystery P.I.™: The Vegas Heist locations to solve the case and unlock Unlimited mode to search for every hidden object in every scene with no time limits. It´s the perfect investigation, in the coolest location, for the master Mystery P.I. Comments: If you like this series of games, you might also try, Escape Rosecliff Island, or Amazing Adventures (Around the World, The Caribbean Secret, The Lost Tomb), all on Verizon's service, and all by SpinTop games.